The 49ers weathered a USC comeback for a thrilling 72-71 victory on their home floor on Thursday. Long Beach State head coach Dan Monson started off his postgame press conference by saying the game between The Beach and USC wasn’t make-or-break for either team. The game had no implications other than a tally in a win or loss column, but it had a much bigger meaning for Long Beach. In front of a packed crowd of 4,410, the 49ers weathered a USC comeback for a thrilling 72-71 victory on their home floor of the Walter Pyramid in Long Beach. It was only their second win of the season and it marked the 49er debut of former UCLA guard Tyler Lamb, but it was the first time since 2001 that a Pac-12 team played at the Pyramid. What it really showed was the gritty mentality that Monson has instilled in the team in his seven years at The Beach. "I’ve been asked, ‘Is the schedule too hard?’" Monson said. "But we’re not going to back down from any of the expectations from this program. We’re 2-9 now and we still expect to win the league and we still expect to go to the NCAA Tournament and if we would have lost today I would have said the same thing." What a night. One last HUGE shoutout to the 4,400+ at the @WalterPyramidLB tonight. Great crowd and atmosphere #GoBeach! With one of the toughest non-conference schedules in the country annually, Monson has showed that his team is not going to back down to any team on any court, but this was the first time a bigger team from a bigger conference came into their house and the 49ers successfully defended it. "I think it’s important to note that not a lot of teams would do that," Monson said. "Kevin O’Neill was gracious enough to schedule it and Coach (Andy) Enfield had enough character to honor it when he came here." Last season, North Carolina traveled to Long Beach to play in a nationally-televised affair at the Pyramid. But that was when the team was coming off of an NCAA Tournament season and the profile of the scrappy Big West program was still somewhat elevated. Long Beach opened up with an awful stretch this season after dismissing a handful of its top players. But as Monson said, the bar has yet to be lowered. "Somebody tried to ask me the other day about rebuilding," Monson said. "I said, ‘You know? My job is not to rebuild, I’ve been here seven years.’ In the last year we made some changes but we don’t need to be reloading and there’s a big difference." In his first game back since undergoing knee surgery as a member of the Bruins, Lamb helped UCLA get off to a hot start in the first half. The Beach set a season-high with 50 points as they led 50-36 at the half. The Trojans’ J.T. Terrell was also available for the game after becoming academically eligible, but Enfield opted not to play him due to lack of practice time over the last month. In the second half, the Trojans launched a slow but steady comeback, finally limiting Long Beach’s transition game and overtook the 49ers when Julian Jacobs stole and drove down for a fastbreak layup. But with 17 seconds left, Mike Caffey (22 points) made a beautiful read in the paint and drove past two USC bigs for a layup to win the game. "I knew as soon as he went to the right it was a layup," Lamb said. "That’s all we needed." What USC is doing is rebuilding – changing the culture of the program with a new head coach. 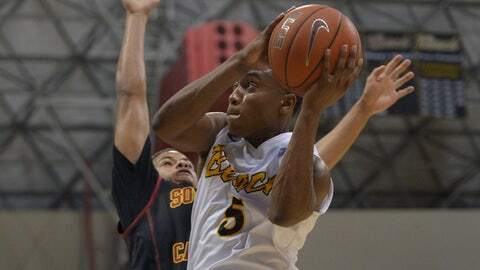 What Long Beach State is doing is simply finding a new path. "This program has taken a step back this preseason," Monson said. "We had to take a step back to hopefully take four or five steps forward."